Harvest weed seed control (HWSC) means using practices at the end of the season that destroy or remove seeds from escaped weeds. These practices are meant as preventative measures to halt the entry of new seeds into the soil weed seed bank. They are not currently widespread in the US, but may become more necessary with the increased pressure of herbicide resistant weeds. We are leading research to understand the potential impact HWSC could have on weed management in the US. Specifically, members of our team are testing narrow windrow burning, chaff cart weed removal, and the integrated Harrington Seed Destructor (iHSD). The projects are taking place in at least four locations including the University of Arkansas, Virginia Tech, and the USDA Agricultural Research Service in Beltsville, MD and Urbana, IL. Weeds that survive in-season control applications and mature through harvest-time need to be controlled so that they don’t set seed and increase the soil seed bank. However, herbicides are not designed to be effective against mature plants and their seeds. For this reason, mechanical techniques are looked to for late-season control. The spread of herbicide resistant weeds has raised particular concern over escaped weeds, spurring the development of innovative harvest-time control methods. Harvest Weed Seed Control (HWSC) is a category of mechanical weed management techniques designed to prevent additions to the soil seed bank at harvest by capturing and destroying escaped weed seeds. HWSC also helps prevent the spread of weeds to other fields by destroying the seeds in-field. Because the majority of weed seeds are contained in the chaff portion of the crop, HWSC tactics specifically target destruction of the chaff. HWSC should not be thought of as weed control for the current season, but rather as an important management measure to decrease weed pressure for future seasons. 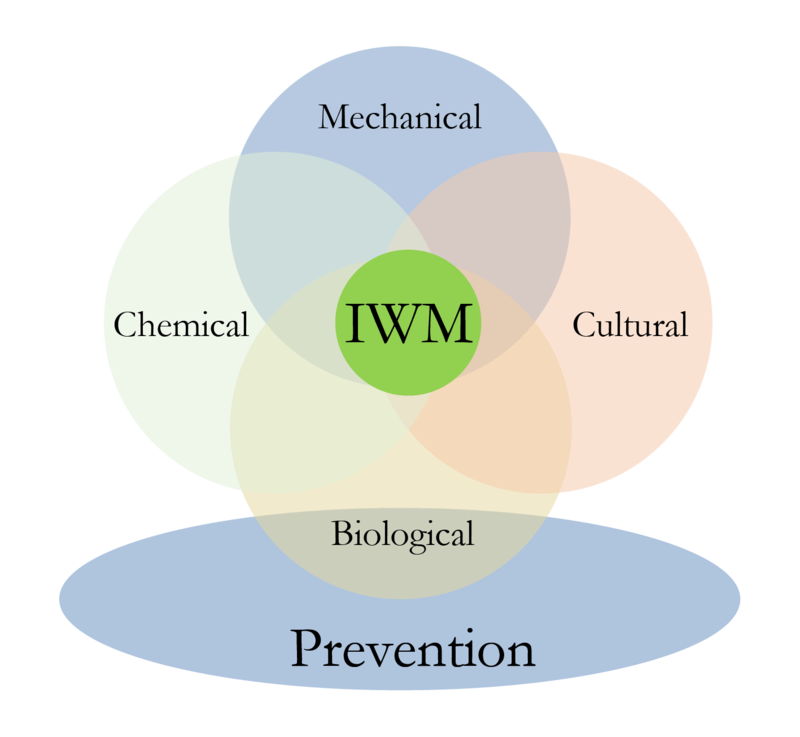 These technologies are relatively novel, and research and development is currently ongoing to evaluate their potential effectiveness in several US regions. Currently, HWSC is most widely adopted in Australia, where multiple herbicide resistant weeds has motivated their adoption by a large proportion of small grain producers. In Australia, a 2013 study found that various HWSC techniques (described below) destroyed between 75-99% of weed seeds at harvest (Walsh et al. 2013). HWSC methods include narrow windrow burning, chaff carts, baling, and the Harrington Seed Destructor (HSD). A chaff cart is a large bin that follows the combine during harvest, collecting the weed-containing chaff that is ejected from the combine. By collecting chaff that would otherwise be blown back onto the field, the cart removes potential weed seeds from the field and allows them to be disposed of. 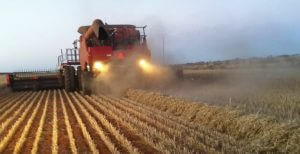 The Australian Herbicide Resistance Initiative tested chaff carts on several commercial harvesters and found that they collected between 75-85% of annual ryegrass seeds that entered the combine during harvest (Walsh and Powles 2007). The collected chaff is then emptied into a pile either on the field to be burned, or off of the field. Burning the pile on the field minimizes the risk of spreading weed seeds to other areas. Burning in a large pile can create temperatures high enough to kill the weed seed. The feasibility of the burning method in the mid-Atlantic partly depends on state and local burning regulations. Alternatively, the chaff pile may be composted to destroy the seeds; proper composting methods create internal temperatures hot enough and for long enough time periods to destroy most weed seeds. Chaff carts provide a relatively simple method of HWSC that doesn’t require highly specialized equipment, making adoption relatively simple compared to other HWSC methods. 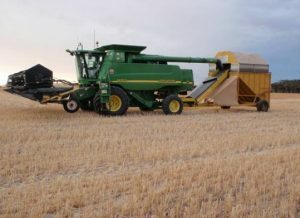 However, the primary challenge of chaff carts is that their size and weight add on to already large harvest equipment. This may add a level of difficulty on small fields and more potential for soil compaction. Chaff carts are currently used by some Australian small grain producers, and are being tested by the University of Arkansas in soybeans, in collaboration with the Australian Herbicide Resistance Initiative. They are not currently being tested in the mid-Atlantic. The Harrington Seed Destructor is a grinding machine that is dragged behind the combine during harvest. It grinds and pulverizes any weed seeds that are ejected from the combine in the chaff. We are testing this equipment by operating it in fields infested with problem weeds including waterhemp and redroot pigweed, and observing how well it destroys the weed seeds. We are also doing stationary testing on several other problem weed species like giant ragweed and cocklebur by running seed-containing chaff through the HSD while it is sitting still. By running these trials over the next four years, we will be able to evaluate its long-term effect on weed pressure by quantifying the extent to which it decreases future weed infestations and prevents seed bank development. This machine operates in Australia, but is not yet used commercially in the United States. In order to begin evaluating it on our weeds of concern, the U of AR group inserted known quantities of weed seeds and crop chaff into a stationery model of the iHSD to compare the amount that enters with the amount of seeds that survive processing by the machine. For all of the species tested, the iHSD destroyed over 97.5% of the seeds to the point where they could no longer germinate. The next step in this research will hopefully include testing the iHSD in a combine on production soybean field and rice in order to better understand its capacity in real world settings. Destroyed pigweed seeds after exiting the iHSD during testing in Arkansas. Photo: Lauren Lazaro. 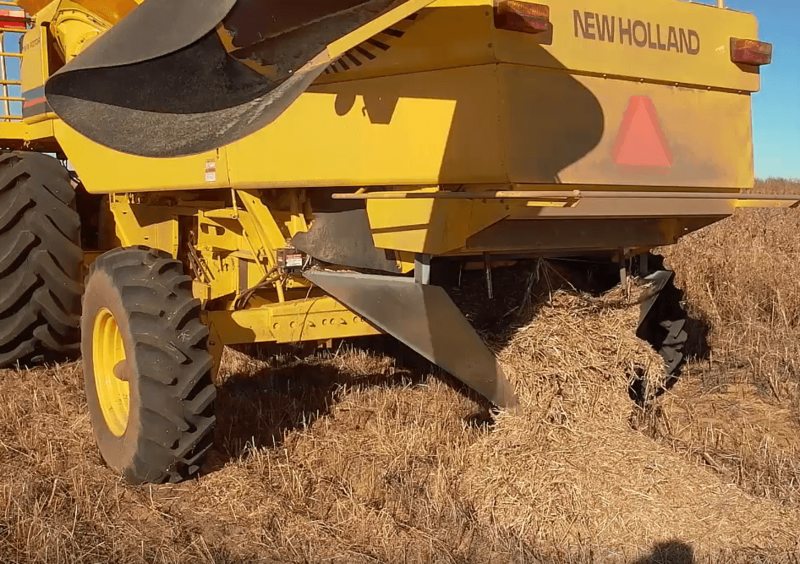 A third HWSC method, called narrow windrow burning (NWB) involves forming the chaff into narrow windrows as it exits the harvester and then burning it to destroy the weed seeds contained within. The windrows are formed by directing the chaff through chutes that are built onto the back of the combine (Walsh and Newman 2007). Narrow windrows provide much more effective weed control than burning the whole field, because concentrating the chaff creates high temperatures that are adequate to destroy virtually all seeds (Schwartz et al. 2016). Currently, it is most widely used in small grain crops. Chaff being formed into windrows during harvest in preparation for narrow windrow burning in a western Australian wheat field. Photo credit: Rob and Andrew Messina, ABC News Australia. While this technique has shown success in Australia and in Arkansas, it is not well known whether it will be a viable HWSC strategy in the mid-Atlantic. Its success is dependent on state-level burn regulations and timing of rainfall in our region, which differ from Australia and the southern US. However, several years of testing at the University of Arkansas show promising results, and 30% of producers in Australia use it as an effective method to control multiple-herbicide resistant ryegrass. In Arkansas, NWB testing has shown 100% kill of Palmer amaranth, morningglory, johnsongrass, and barnyardgrass seeds in the windrow. 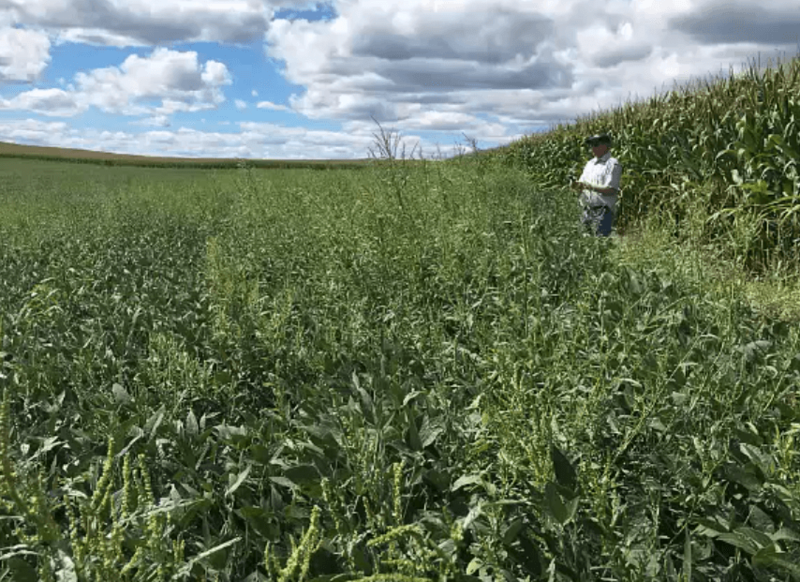 Over 3 years, this resulted in a 73% reduction in escaped Palmer amaranth plants and a 62% reduction in the Palmer amaranth seedbank (Norsworthy et al. 2016). Australian trials have killed 99% of annual ryegrass and wild radish seeds in wheat, canola, and lupin stubble windrows (Newman 2014). There are several ways growers can optimize their burn technique to optimize success of their NWB. According to NWB experts in Australia, high temperatures are key; burn temperatures should reach 400 degrees C for 30 seconds at any given spot in the windrow in order to achieve complete seed destruction. For instance, 10 seconds at 400 degrees is sufficient to destroy ryegrass, while 30 seconds was needed to destroy radish seeds. The speed of the burn is also important; a slow burn equates to a higher temperatures, as does denser biomass of the windrows. It is also important for the burn to reach the soil surface below the windrow, to contact ground-level seeds. 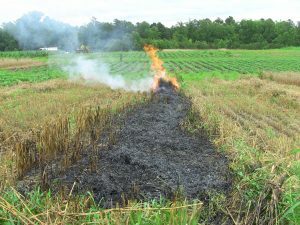 Because different crops burn at different rates, burn protocols in the mid-Atlantic would need to be designed to meet the needs of the crops in our region. Challenges to narrow windrow burning include complying with burn regulations, retrofitting the back of the combine to eject chaff in narrow windrows, keeping the windrows far enough apart to prevent fire jumping, and harvesting at an appropriate speed for dense windrow formation. Poor weather conditions include high temperatures, high winds, and rainfall at the time of burning all affect the success of a burn (Newman 2014). In the mid-Atlantic, autumn rainfall may create excess moisture that challenges the ability to perform an effective windrow burn.